Well, think we might as well rename July-August as High Summer! Every month, we do a little news round up of goings on in and around Fethiye – points of interest that wouldn’t merit their own blog post – and also a bit of a recap of what we’ve up to, too. Hmm, well if you’re someone who follows these round ups, you’ll know that July 2015 is missing, so we’re now doing a merged July-August post. Exactly the same thing happened in 2014, too. Every Monday morning, on our Facebook page, we share a basic weather forecast for the week ahead, and, as you might expect, there’s been little variation from what you’re looking at, above. Occasionally, there’s been a downpour or a thunderstorm forecast and we’ve waited eagerly for those to arrive…only to see that weather trapped in the mountains that surround us. That’s what’s helped the humidity along! Summer breezes are slowly, slowly starting to cool us all off, however, and we’re looking forward to a more comfortable September…please. If you don’t use Facebook and you want to know what the weather’s like in Fethiye right now or at different times of year, don’t forget we have a dedicated Fethiye weather page where you should be able to find what you’re looking for. It’s not as if we’ve been big party animals or anything like that that’s made July and August almost happen around us without us noticing. Not really sure what our excuse is to be honest. Life? Anyway, ‘not staying in’ obviously means we’ve been out somewhere on occasion. Barry’s birthday in July meant we had a good excuse to escape to Kabak for the night where we stayed at Sultan Camp. We also took ourselves off to Kayaköy to watch one of our favourite Turkish bands, Baba Zula. We’ve been to meet friends at Deep Blue Bar for a birthday party and, on more than a handful of occasions, we’ve just gone off to chill for a while and enjoy the breezes at Zentara Beach & Kitchen. Summer life, out and about – nothing too strenuous, you see…and the days just disappear. Ahhh, do you know what; we’ve spent a lot of time at home recently working very hard – working very hard on this love of ours; this blog. That’s where all the time is going! And that means there’s a few things we need to tell you about because, apart from adding new posts, we’ve been making lots of changes (improvements, hopefully), too. 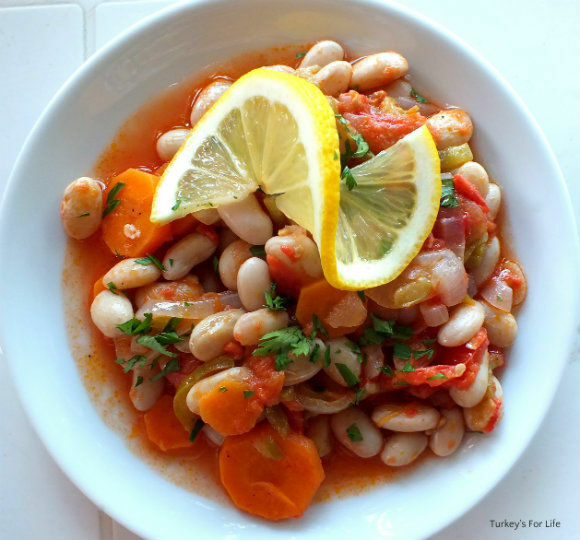 Yeah, we finally got around to adding a new recipe to our collection of Turkish recipes. If you remember, that was a salad we’ve eaten a lot of over this summer; a refreshing green lentil salad. But we also want to tell you about our old recipes, too. Barry had the brainwave to create an area where you can see all of our recipes, complete with photographs, all in one page. So he set about doing that and we now have our feast of Turkish recipes, easily accessible. Either click that link or, if you’re in the blog, you can also get to this page by hovering over the ‘Food & Drink’ dropdown at the top and clicking on Turkish Recipes (or via the 3-line ‘hamburger’ menu if you’re reading our mobile version). Over the years, we’ve shared many recipes on the blog. These are foods we cook and prepare all the time at home and now, we’ve added an extra feature – a recipe box – to the blog that makes our recipes easier to follow, save and/or print. All of our new recipes will have this feature but we want our existing ones to have this feature, too. So, slowly, slowly, whenever we have a spare couple of hours or so, we’re going through each recipe, adding new photos where necessary and also adding the recipe box with clear instructions which you can print off or save. There’s a slight method to our order of play – we make a meal, suddenly remember it’s on the blog, and then we go into the recipe to edit it. So far, it’s our meze and salad section that’s getting most of our attention because these are the foods we’ve been making the most whilst the weather’s been so hot. So what’s been cooking in our little household, then? 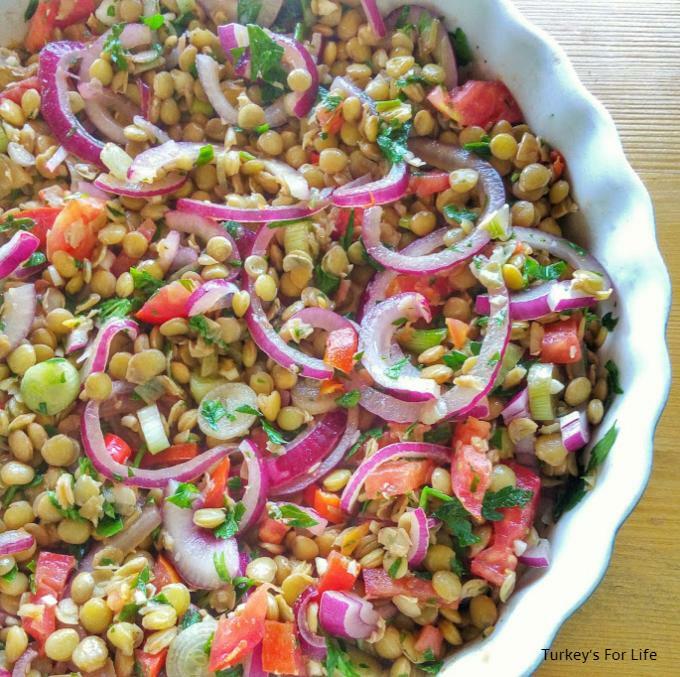 Our recipe for kısır, a bulgur wheat salad, has been updated. Okra is currently in season so we’ve made our Okra in olive oil recipe look more presentable. And barbunya (cranberry beans) is also in season, so our barbunya recipe has received the recipe-box-treatment. A recent urge for a simple, tasty brunch of eggy bread means that recipe is now sorted, too. Another Barry brainwave has seen him spending the last three or four months building these new Fethiyespor pages and trying to research where some of the stadiums are – it was tough task, on occasion! Click to read all about Fethiyespor – just a bit of an intro to the ins and outs of the team. If you do want to follow Fethiyespor’s progress when the season starts in September, bookmark the following two pages so you can see what’s going on: Click here for all Fethiyespor fixtures and results – and this is the link for the Fethiyespor league table. It’s all very pretty (if you like those colours) and you can access each page via the others. There’s even a countdown to the next match! We love that little extra. 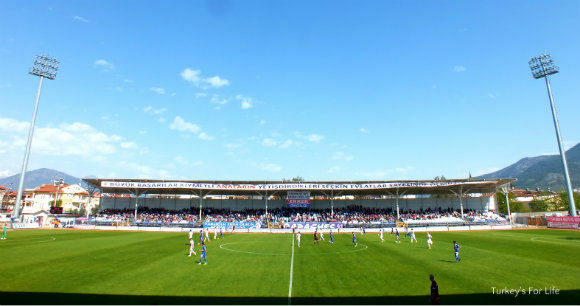 Oh, and just hot off the press as I type – Fethiyespor v Bucaspor Friendly Match. If you’re around on Friday night (28th August), kickoff is 8pm. 5TL entrance or free if you have a season ticket. As you can see, we’ve been a tad busy of late so our news round up for July and August has been a bit different – more about us in Fethiye rather than about the town itself. And with a lot of friends coming over for summer hols throughout the whole of September and most of October, we’ll hazard a guess that normal life shall not be resuming just yet… That’s summer in Fethiye, you see. . . it’s all very well for you young sprogs – us boffers have barely shown our noses outside of the house in this heat! Roll on getting our mountain hide away sorted for next year!